Surprise, surprise, the new Martian Mania slot has been a big hit since it launched earlier this summer at Lucky Club Casino. Might be the great bonus features. But I think players just love the hilarious aliens! Whatever the reason may be, the metro-style online casino reports that the new game from Nuworks has been its most popular online slot game this month. Have you played Martian Mania yet? It's is a 25 payline game with a bonus feature where Aliens zap humans to reveal instant prizes. There's another bonus game where you uncover aliens disguised as humans to win free spins. 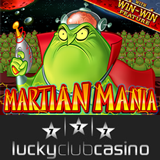 Best of all, Martian Mania’s Feature Guarantee ensures that this bonus round is triggered in 26 to 250 spins. And the Win-Win feature makes sure you win during the bonus rounds. Lucky Club Casino offers a wide selection of games from Nuworks, available at only a few chosen casinos.